Riding a motorcycle after the sun sets in can be counted anything from a dangerous experience to an enjoyable and a safe one provided adequate safety measures are taken. 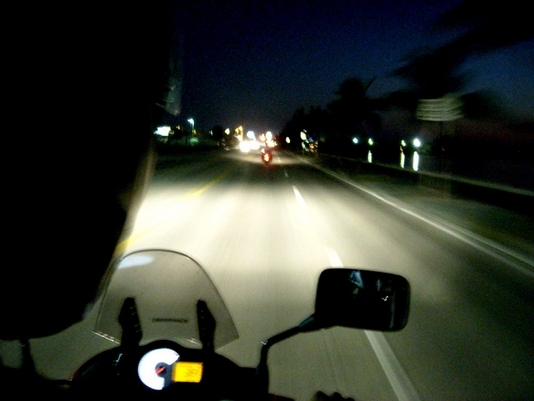 Most riders avoid night riding as much as possible considering the low light conditions on the road, bugs splatter and low levels of visibility of objects ahead making it a recipe for disaster, and in worst cases- a crash. Chances of help are also relatively lower during dark. But, with all these in mind few prefer night riding as they believe and have proved in several cases that they can be more consistent in munching more miles without hitting fatigue wall and keeping engine temperatures cooler than daytime riding. One of the most important aspects of night riding is illumination in the dark. 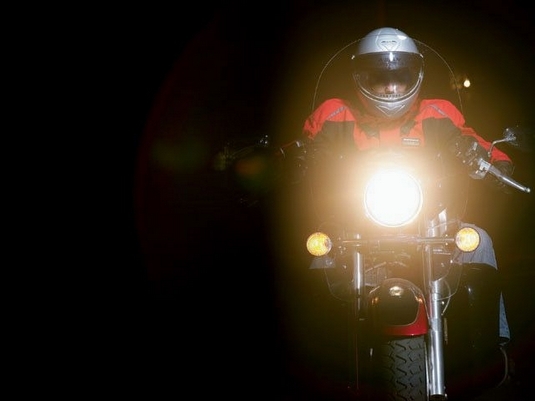 Consider that your eyesight is OK and rest that determines the illumination of the road is the Motorcycle’s headlights. Most modern touring motorcycles come with a high illumination set-up giving a good insight of the road ahead. On the other hand on some of the sport bikes. not actually designed for touring purposes, come with an average light output. But again most of the stock bikes with poor lighting set-up can be upgraded to a bigger and a brighter light set-up by means of a bigger lighting generator or an after-market light set-up. Extra care must be taken while upgrading the set-up as not to overload the existing alternator or burn the existing wiring configuration as excess current flowing can burn the system electricals. As we are primarily focused that headlights are used only to illuminate the road ahead, we often forget that they are designed to perform certain functions too. While ‘Low Beams” offer wider, shorter throw of light with a cut-off in the height which saves the oncoming driver of a direct blinding throw. The “High Beams” offer a narrow, longer throw of light at a certain angle which illuminates the entire road ahead. Care must be taken not to tamper their functions they are actually designed for. So, by upgrading to a better lighting set-up, keep the above points in mind and avoid blinding the other drivers with an improper set-up which may be very bright, but could prove fatal in most cases as light blinded drivers might come straight onto you messing up the situation. As seeing is pretty much covered now it’s your turn “To be seen”. As the whole scope of night riding is seen with riders loading up their bikes with LED’s, auxiliary running lights, neon sticks and more. The best practice is to keep your self seen in the dark. 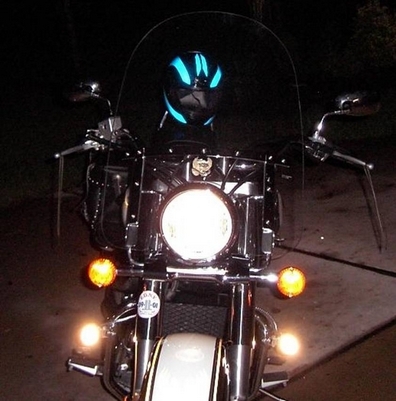 Wearing dark coloured riding gear would definitely look cool but at the risk of being invisible on the road. So, here again choose your riding gear wise. The best way one could be identified as a Motorcyclist in the dark is by use of Auxiliary lights that could raise eyebrow’s to others making them slow down gradually not knowing what’s coming towards them. A cheaper alternative is to use Prismatic or reflective tapes that could easily reflect light and help identify you at a very safe distance. Pasting those tapes as per the colour coding also has a special meaning to it; as per DOT specifications the rear of any vehicle would bear “Red” reflective tape, “Amber” for the sides and “White” for the front. Ever wondered why is it not recommended to mix up? For a simple reason that if mixed up with colours one wouldn’t be knowing if the vehicle is moving away or travelling towards you. With night riding on the schedule, get yourself prepared for the day. Always wear a helmet that has a clear, clean and an unscratched visor. It’s highly advisable to carry a lint free cloth preferably a micro fiber cloth to keep the visor clean along with Visor cleaning agents or even plain water that would take care of the job. Also understand that even with the best headlight set-up some details of the road may escape from the light, be it sudden gravel showered on a turn or even an unexpected speed breaker. Always stay alert throughout the course even though you might know the roads pretty well. Always remember, the most dangerous thing out there on the roads are the inattentive drivers. As bad as they are in the daytime, statistically they are even worse and have high chances of making mistakes in the night. So, the rule is never let anyone tailgate you and vice versa. Give yourself plenty of distance to be able to stop at a safe distance in case of a mishap. If you are tired, don’t push it far more than you could handle. Simple reason- being too tired or stressed can make someone as worse as a guy driving under influence. But with proper mental and physical preparation apart from the possible mishaps, with enough rest and readiness, night riding could be much more fun than the day ones. So, by just not leaving anything up to luck, anticipating realistically would make the night riding experience a better and a safer one.